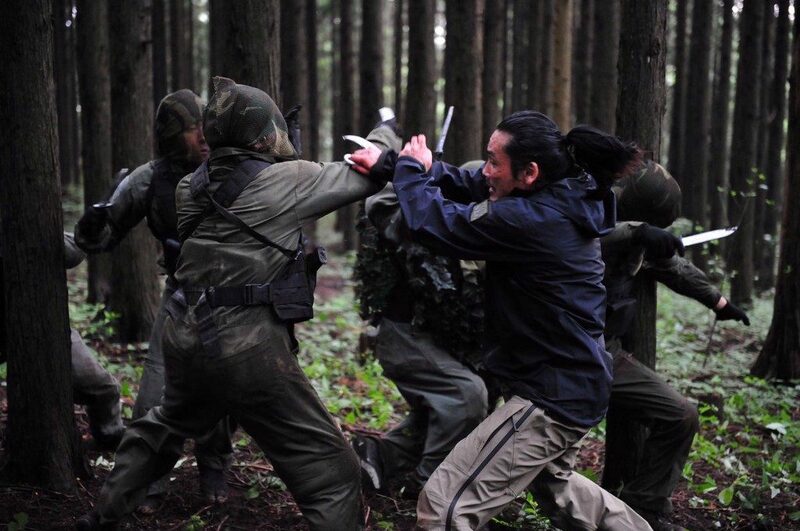 From the opening scene of a special forces team being taken out by a mysterious figure, to the final climactic showdown, “Re:Born” is a martial-arts action film that pulls no punches. Early on in the film we meet Toshiro, who lives a fairly mundane life managing a convenience store and taking care of his niece Sachi. We soon discover that Toshiro has a dark past, possibly in the military, as he tells his psychologist that he has recurring dreams of killing. Soon Toshiro’s peaceful existence is brought to an end when a team of assassins is sent to kill him. We learn that Toshiro, codenamed “Ghost”, used to be a member of this group before splitting with its leader “Phantom”. Now he must fight against his former boss in order to save himself and his niece. This is a film that knows exactly what it is setting out to do and attacks it with gusto. Director Yuji Shimomura worked previously as a stunt coordinator on a number of films and it shows here with some impressive action and fight sequences. It reminded me of Metal Gear Solid in parts, with the legendary protagonist fighting his way through a group with codenames such as “Newt”, “Fox” and “Abyss Walker”. Early in the film we are given an introduction to the character of Sachi as she carries a dead cat along the road to a beach to bury it, along with some sombre shots and a voice-over discussing the horrors of war. This may lead you to think that this will be a more contemplative film that it turns out to be. In fact, this set-up is only a pre-amble to the main feature which is a string of fight sequences held together with the slim plot of “super soldier getting revenge on former boss”. I didn’t find this too much of a problem, although I would have liked more of the character stuff we see early in the film to carry on through it. However, I can’t complain when they have a sequence of a man taking out a team of soldier with a shovel. Worth noting at this point that the sound design of the film was great, with whistling throwing stars, the metallic clang of aforementioned shovel as it strikes a face, and the usual selection of martial arts weapon noises. Kenji Kawai provides an energetic score that also has its thoughtful moments. There are some great performances by Tak Sakaguchi as Toshiro, the legendary super soldier, Akio Otsuka as Phantom, the leader of this band of mercenaries, and the young Yura Kondo as Sachi. Mariko Shinoda also appears as one of the team sent to kill Toshiro, further expanding her range after her role in Sion Sono’s “Tag”. Ultimately, the film intends to be nothing more than a solid action film and throws most of its energy into the fight sequences. While the middle part of the film suffers a little, leaving behind characters and plot for the sake of an extended action scene, it cannot be denied that the fantastic choreography, and innovative fighting styles utilising guns, knives and hand-to-hand, does make for an entertaining watch. The film does attempt some message about heroism, but to be honest it is not worth troubling too much about the meaning here. Instead just sit back and enjoy this fun, well-directed, violent martial-arts thriller.